Today is a very very snowy day in the UK. I am on my annual leave and I thought it was a lovely coincidence that the worst of the weather is on my day off as there is no way I could get to work on these conditions. It looks very beautiful outside though! So bright and white. I have been doing lots of reading today and it has been great! I really want to get past A Court of Mist and Fury already but I feel it is dragging on a bit. 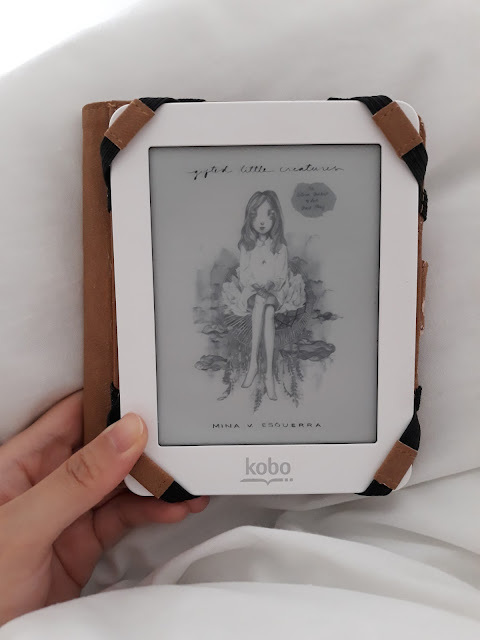 I came across this freebie from Filipina author Mina V. Esguerra and it was a nice, sweet and short read. Gifted Little Creatures, I believe, is a short story based on the author's Interim Goddess of Love trilogy which I haven't read yet. After reading this story, I am considering getting a start on the trilogy at some point because honestly I couldn't really get the premise from the short story alone. I did find it interesting, however, and it really did catch my attention. Gods and goddesses walking among humans, anyone? And how cute is the illustration on the cover? 💕 I find it funny as well that I'm also reading ACOMAF which is about faeries getting themselves involved with the mortal world. I think in March I need to read a book that's more real-life and less dystopian/fantasy. I do love this genre - don't get me wrong. But maybe I need to switch things up a bit so I don't get into a reading slump.